One of the real benefits of having hybrid golf clubs, the utility clubs in your bag, is the sheer versatility that these offer you over and over a long iron. Troublesome long irons are often difficult to hit, but hybrid clubs are very versatile. In fact a lot of people call them utility clubs, because they do so many different jobs. So we are going to start off looking at long chip shot here. So a long chip shot would be sort of a bump and run, and that’s really very high, because I don’t have a great deal of loft on my five hybrid as I have here. But it’s going to be a long chip shot, I played around about the center of my stance and I grip down on the golf club. That’s quite a crucial part of this, I get quite near to the ball, because of my grip and I can have a narrow stance. From there, it’s like a long putting stroke, just a long backwards and forwards putting stroke. And you got to question when was the last time, you fatted or find the putter, very rarely would that ever happen. So if I use a long putting stroke here, it should guarantee that I am going to get a decent contact on the ball. I will pick out a landing area just on the fringe of the green with a bit of grass that I can run the ball through to get it up to the flag at the back of the green. And that’s a long chip shot there, just backing through almost with the putting stroke that runs up. Another shot that’s quite useful for us to play with a hybrid golf club, is actually just chasing the ball full without trouble, sort of punching it out of trouble, particularly if you have got yourself in the trees and you need to get a ball that comes back quite low. So normally in trouble, we would say, we will take more loft that’s safer, but if more loft is going to hit the ball high into the branches and I don’t want that, I need something that low, that chases the ball forward. 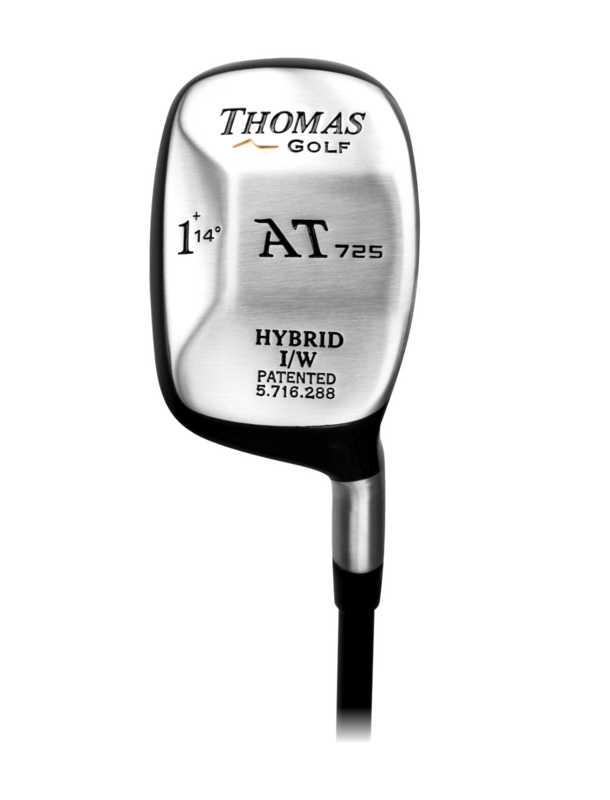 So again, I take my five hybrid, this time I play it quite a long way back in my stance. I have the handle quite a long way forwards towards my front leg and I hit it down quite firmly and steeply on the back of the ball. And this thing comes out like a bullet really low and runs quite a long way, very useful shot here. So I play it back in my stance, hands well ahead, and nudge it forwards, a very punchy stroke. And that’s gone comfortably a 130 yards and hasn’t really gone above head height. One of the very useful shot here, is going to be playing out to fairway bunkers. Now if when you get into your fairway bunker, generally fairway bunkers are little bit larger and a little bit flatter, than normal green side bunkers. So you don’t have to take your sand wedge and splash it out, you could actually take a club that’s a bit more risky, but hits the ball further. So as long as when you assess the bunker shot, the leading edge in the lift isn’t too high, you could do it using your hybrid club to play out of that bunker. So I would look at my distance and I think, well, I have got 180 to go out of my bunker, the leading edge is quite low. I fancy my 5 hybrid here, now because the 5 hybrid has got a nice rounded sole, a lot of weight is low and deep within that sole. This club isn’t designed to dig into the sand, so I actually want to try and play this ball quite clean and just nip it off the surface. So the way I would set up to this ball is playing it just slightly ahead of center, not too far forwards in the center, because then I might hit the ground behind it in a bunker. So I will play just ahead of center. I am actually going to advocate just gripping down half an inch here, but it just stops the club from digging in too much and catching it heavy. I am always playing to sort of semi-thinness and take it clean off the surface. So I grip down half an inch. Well, the last thing I would do with my hybrid club playing from a fairway bunker is just increase my grip pressure, grab it a little bit tighter, that way, if it was to hit the ground heavy and fat the ball a little bit, because I have got plenty of grip pressure, the club would keep moving through the sand, get to the golf ball and still fire it at a reasonable distance. So I would just anchor my feet in the sand a little bit, grip down a little bit, play it just ahead of center with quite tight grip pressure and a nice smooth balance swing hit to the semi hit and I have played that really nice and clean off the surface, there was no big thump down into the floor there, because in a fairway bunker, that would be a very heavy contact. And that’s three, really useful shots that you could use your utility clubs or your hybrid clubs to perfect and improve your scores.